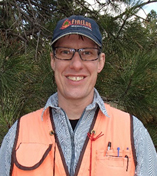 Dr. Nate Anderson is a Research Forester with the Rocky Mountain Research Station of the U.S. Forest Service in Missoula, Montana, where he studies forest resources management and economics. He is a co-Principal Investigator and member of the Executive Leadership Team for the Bioenergy Alliance Network of the Rockies (BANR) and was Director of a 5-year USDA-NIFA funded Biomass Research and Development Initiative (BRDI) project – both of which have significant biochar research components. Nate has a PhD in Forest Resources Management from the State University of New York College of Environmental Science and Forestry, an MS in Conservation Biology and Sustainable Development from the University of Maryland, and a BS in Biology from Bates College.